SUMMARY: After focusing on building up users and artist information since 2007, concert resource Bandsintown decided to leverage their database to work with promoters, venues and labels to create relevant content and timed sends for users. See how the team was able to reach users at the optimum time, with compelling copy, by using geographical, social media and artist data. Bandsintown was founded in 2007 as an artist-focused platform. The idea and the initial goal was to make sure artists can easily upload their tour dates to Facebook. "We have Bandsintown concerts, which is the concertgoer-facing app. It's also a website and a Facebook app, and that gives you the opportunity to sync your social networking account, sync your streaming music account," said Jon Ostrow, Director of Sales, Bandsintown. The company creates a music DNA based off their algorithm and social accounts that allows consumers to track artists that are relevant within their area and then sends either an email notification or a push mobile notification when shows have just been announced, are going on sale or are upcoming. Then, as of about a year and a half ago, the company leveraged this information and their email list to create a promoter side called 'Bandsintown for Promoters,'' which is "a dedicated email program … that allows us to target those concertgoers by artist preference, by location and by behavior," he said. Then the marketing and ad ops team builds out a customized email program that supports the marketing initiative of the artists, via promoter, venue, label, artist or manager. "That could be a specific show date, a pre-sell time or on-sale date. That could be supporting a tour, could be supporting a festival, could even be supporting an album release or some other kind of up-and-coming event that's happening for the artist," he said. The email marketing is so targeted because, "we are marketing to music fans who are very passionate. They're not just fans that stream or listen to music. These are fans that actually go to a show. They leave their house, they buy a ticket, they go to a show, and then they talk about it on social networks with their friends," said Leah Taylor, Director of Communications, Bandsintown. There are a lot of ways concert-goers can get information from Bandsintown, Ostrow said, but this effort ensures that if there is a pre-sale opportunity, or if the send is dealing with a popular artist that will most likely sell out on the on-sale date, these campaigns heighten the chance customers will get the offer at the right time to buy tickets. "I think it ups the ante from us working with promoters and working with the artists, venues, to make sure that users are getting the best information as soon as they can," he said. "The big challenge that the industry as a whole faces, and that's something that Bandsintown has really led the charge on, the fact that there's a statistic out there that 40% of seats go unsold," said Ostrow. That's a challenge for Bandsintown, as well as promoters, artists and "anyone else that's involved on the touring side for artists. We introduced this dedicated email program, 'Bandsintown for Promoters,' as a way to help promoters to push the events further than they're already doing," he said. This gives Bandsintown and the promoter side a much more targeted and customized way to speak to concert-goers. The sends can be changed depending on the point in the sales-cycle, and there is customized content for those strategic times. "That could be at really any point during the sales cycle, whether it's hitting pre-sale time and pushing awareness to those core fans of the artists performing or other affinity fans of similar-sounding artists. It could be a specific on-sale date, or it could even be just a few weeks before the event, trying to boost ticket sales," he said. "We just passed a major threshold this past week. Bandsintown now has 15 million installed users. That's fans who have gone to the Facebook page and installed the app or downloaded it on iOS or Android," said Taylor. From that pool of dedicated concertgoers, Bandsintown knows information, such as artists they like, what types of shows they are going to and geographical locations. Bandsintown leveraged this data in 'Bandsintown for Promoters'' to work with promoters, venues and labels to create customized emails that would keep users better informed of concerts and events within their area. All the campaigns are based on artist preference and geographic location within core fans and affinity fans, according to Ostrow. From there, there is a promoter's portal where promoters can log in and set up certain targets before working with the ad ops team to build the campaign. "There's a customized element to it where it's not just a simple automated piece … It's more working with a team to optimize the effort that's happening," he said, listing copy, targeting and timing as elements the team looks at to ensure "we're getting the strongest ROI … with this campaign." Combining that information with what a promoter or label knows about the artist helps to "make sure both sides of the fence are really optimizing the effort," Ostrow said. From the consumer's perspective, these emails come from Bandsintown on behalf of the artist to support a specific show or release in their geographical area, "but it's tailored specifically to you to make sure you're not getting this custom email for a show that's two states over. It's very specific to your preference, to your location," he said. When a user signs up through Bandsintown, there's a few things that happen, he explained. They are prompted to connect any social networking account, such as Facebook and Twitter, as well as streaming music accounts like Pandora, Spotify or iTunes. "We scan those accounts that are opted in, and we can create a music DNA for you that's based on all those artists that you're listening to, or artists that are relevant, [that] you're following," he said. The information gathered from that informs these campaigns and what shows and events a user is sent by Bandsintown. The emails themselves are editorial emails, according to Ostrow, which is "really where the customized elements come into it. It can really be tailored to whatever the event is, and it's customized for that artist's targeting [audience]." "It certainly depends on what the fan base is known to engage with and how we can help incorporate that into the campaign," he said. Bandsintown users receive a weekly digest email that goes out every Wednesday, which is an overall summary of the artists that they are either specifically tracking or similar artists. Alongside the weekly digest email are announcement emails, which are sent when a show gets added to the Bandsintown database, which "there's already an expectation from our users to receive these emails or the push notifications from us. That's really how they focused on hearing from us," he said. The 'Bandsintown for Promoter' emails "extend that relationship with our users, with the Bandsintown community. It gives them the opportunity to receive not just those generalized notifications, more customized, personalized to an artist that they're already tracking, or someone that's very similar to the ones that they're tracking," Ostrow said. The team has found that campaigns have been most effective either during pre-sale or on-sale periods, or at the release date for an album, according to Ostrow. "Obviously these are top of the triangle, die-hard fans of artists. It's more than likely that they're going to be going out and spending a lot of money to go see them live, but they're going to be interested in recorded material and merchant things like that as well," he said. The reasons vary from there because fan bases differ wildly, he added. Bandsintown reaches concertgoers across the world, which is why emails need to be flexible to promoter and artist needs. Also, internal testing shows that with Bandsintown consumers (and you should always test your list to learn what timing works best for you), sends perform better on Thursdays and Fridays than Saturdays. A specific example was when the team was working with Dualtone Records, a Warner Music Group label, on a hybrid campaign for an upcoming album release for a band called Shovels & Rope, which also happened to be going out on tour. "We put the primary focus on the campaign for the album with sort of a secondary call-to-action to learn more about the tour. This went out as a national campaign to core Shovels & Rope fans," he said. 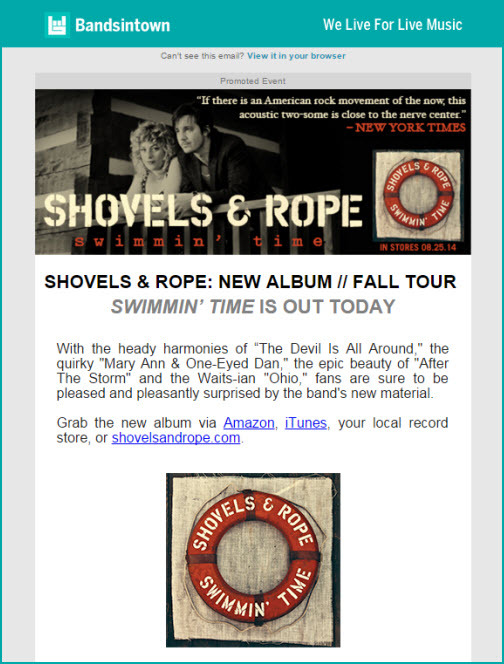 The Shovels & Rope send featured a banner with a promotional picture of the band with an inset of a quote pulled from a New York Times review. The headline announced the album release and fall tour, and the paragraph copy reviewed specific songs from the album, saying, "With the heady harmonies of 'The Devil is All Around'' the quirky 'Mary Ann & One-eye Dan'' the epic beauty of 'After the Storm'' and the Waits-ian 'Ohio,'' fans are sure to be pleased and pleasantly surprised by the band's new material." With the campaign seeing a 57% open rate and a 19% clickthrough rate, it showed the team that "there was clear interest to learn more and hear more from the artist beyond just when the tour dates are happening," Ostrow said. 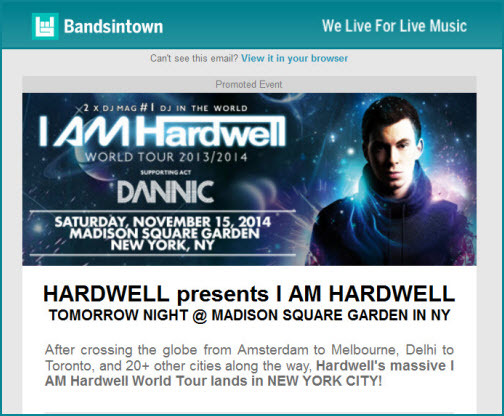 Another example is a pre-sale effort that happened when promoters were trying to increase ticket sales for Hardwell, a DJ playing Madison Square Garden. Timed the day before the concert, Bandsintown included an exclusive promo code for users. "It's definitely been effective for helping to spread awareness, for driving traffic and ticket sales on our end … [promoters] have definitely been really happy with seeing just how engaged our community is through email," said Ostrow. The average open rate for 'Bandsintown for Promoters' is as much as 30%, and the average clickthrough rate ranges from 4-6%. Bandsintown has learned from an internal study that 51% of their users prefer to learn about concerts via email, and alongside that, what they''ve seen from these results is that "it''s just really working," according to Ostrow.